راوندمنيو هو الدليل الأفضل لاكتشاف مطاعم رائعة للأكل او طلب وجبات الطعام في المنزل او حجز العشاء بالخارج في كل من دولة الإمارات العربية المتحدة ، السعودية ، الكويت ، الأردن ، لبنان و جمهورية مصر العربية. RoundMenu is your ultimate guide to restaurants and reviews to find great places to eat and dine out or order food delivery with just a few steps. Choose from the best list of restaurants in the UAE, Saudi Arabia (KSA) Kuwait, Jordan, Lebanon & Egypt. اكتشف مطاعم دبي (5,000) و اكثر من 3,000 مطاعم في ابوظبي، 1,200 مطاعم في الرياض ، 1,300 مطاعم في جدة و 2,000 في الكويت ، 3,000 في القاهرة ، 600 في عمان و 1,000 في بيروت لجميع المناسبات و الفطور و البرانش و الغداء أو العشاء. لذا سوف تجد بسهولة مطعمك المفضل للعشاء في الخارج أو طلب الوجبات في المنزل. Explore over 5,000 restaurants and cafes in Dubai, 3,000 in Abu Dhabi, 1,200 in Riyadh, 1,300 in Jeddah, 2,000 in Kuwait, 3,000 in Cairo, 600 in Amman and 1,000 in Beirut for all occasions, breakfast, brunch, lunch or dinner. You are bound to easily find your favorite restaurant for dinning, takeaway or ordering food delivery. - Discover the best taste of cuisine near you whether you fancy Lebanese, Emirati, Saudi, Indian or Thai cuisine plus pizza, fast food, seafood or vegetarian food. اطلب وجبتك المحددة بسهولة وسرعة عن طريق قوائم الطعام الدقيقة. - Book your table without having to make a phone call and get map directions. احجز طاولتك دون الحاجة للإتصال تلفونيا و احصل على خريطة مع توجيهات للمطعم. - Browse the rich list of food reviews & dish pictures from people like you as well as TripAdvisor, Instagram & Foursquare. تصفح صور للأطباق الشهية و التعليقات من ناس مثلك، وأيضا من ترب ادفايزر، انستجرام، وفورسكوير. - Save on meals with great offers and promotions from restaurants in your city. وفر من خلال خصومات وعروضات رائعة لمطاعم في مدينتك. - Search and find your favorite restaurant quickly to order, call or book. ابحث عن مطعمك المفضل بسرعة و اطلب للتوصيل أو الحجز بالاتصال او الحجز الالكتروني. - Upload your own photos of dishes and share your passion with family & friends. اضف صور اطباقك المفضلة و شارك عشقك مع الأصدقاء والعائلة. Trying to arrange dinner with friends? 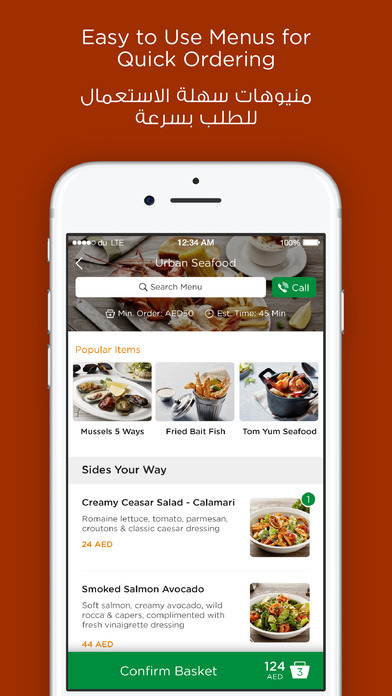 Now you can suggest restaurants to friends with WhatsApp messages... try it! Also improved search filtering for delivery. We are very excited about this version. With your help, we have set out to create "Social Menu" for restaurants. Now you can see which dishes are popular to help you order, and share your dish to help others. Introducing "Carrots" loyalty rewards. Now you can check-in participating restaurants to collect "carrots", and exchange them for rewards. - Buy Credits to save you more money! We hope you will find this version more useful, please do rate it and send us your comments. - minor bug fix that did not accepts your rating of our app, so please do rate us again. - adjusted the booking period to allow for time selection. - added share app button in case you love us so much and decide to share it with your friends. It's the best app that I have been using in Dubai !! Good app but needs more variety. 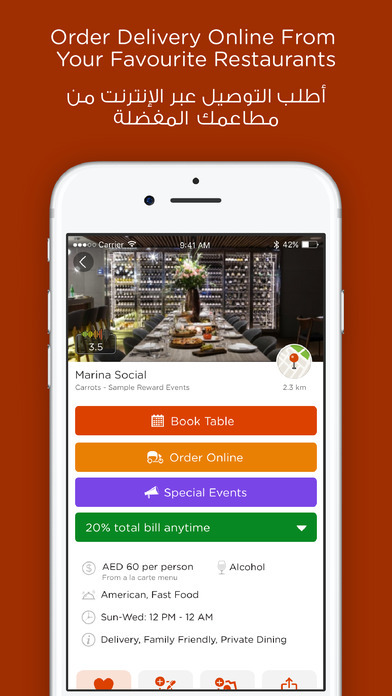 Great app to find good deals in restaurants across UAE. Easy to use and love the location based feature.